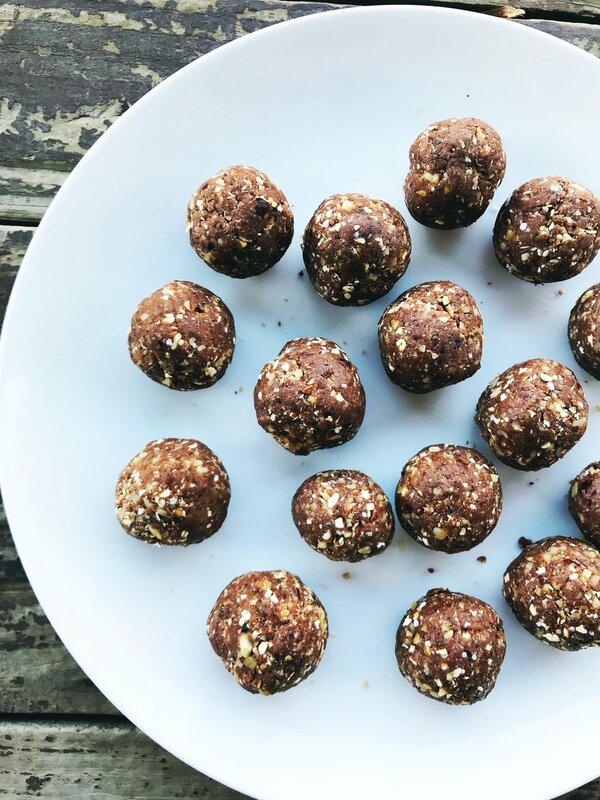 I am OBSESSED with energy bites/bliss balls/date balls/fat balls - call them what you will! The perfect afternoon pick-me-up. Perfect on-the-go healthy snack. Once combined remove S blade from food processor and form into mini balls. Place on plate with parchment paper and place in refridgerator for 5-10 minutes. Icing: Melt coconut oil and add in remaining ingredients. Drizzle over balls and leave in refridgerator for an hour. Enjoy over 5-7 days. May be placed in freezer to enjoy longer. Mix ingredients in a food processor on high until blended into a sticky mixture. Remove S blade and and form into individual balls. Put balls in refridgerator for 10-15 minutes. Remove and enjoy! Place all ingredients (except cacao nibs) in a food processor and blend on high. Once combined into a sticky mixture, form into individual balls. Roll cacao nibs on top of balls. Place in refrigerator for 10 minutes, remove and enjoy! *Did you know spirulina is jam-packed with protien? Spirulina is known to increase fat burning during exercise. It's high antioxidant content makes it beneficial in reducing exercise induced oxidation which leads to muscle fatigue and inability to gain muscle. Place all ingredients (except almond butter) in a food processor and blend on high. Once combined into a sticky mixture, form into individual balls and drizzle almond butter on top. Sprinkle cacao nibs if desired.